A visit to the chicken house” maternity ward” on Father’s Day afternoon was rewarded with the sound of soft peeping. And the drill sergeant-like clucks confirmed that our broody hen had become a proud mama. 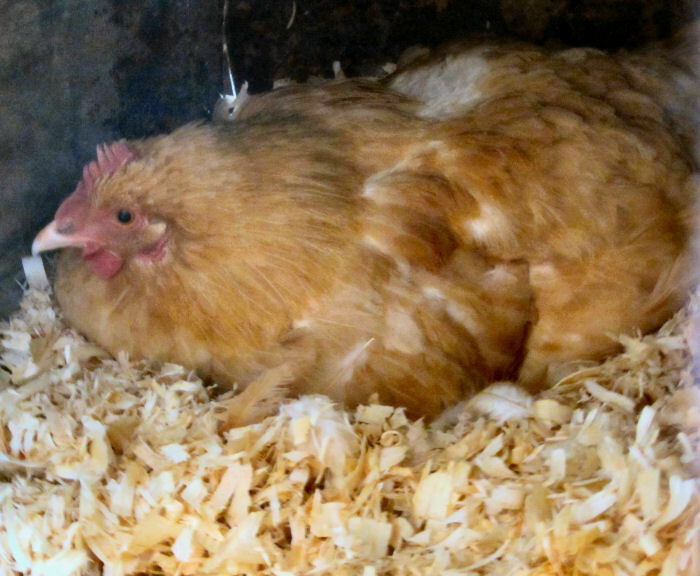 She had spent 3 weeks patiently sitting on her “Baby Eggs” awaiting her little Buff Orpington babies appearance. Mama hen has gone “broody” and is sitting on 11 eggs patiently waiting for them to hatch in to Buff Orpington chicks. All of the “peeps” were finished hatching by Monday morning. ” Biddy” had done a good job – we had given her 11 eggs and 9 hatched. 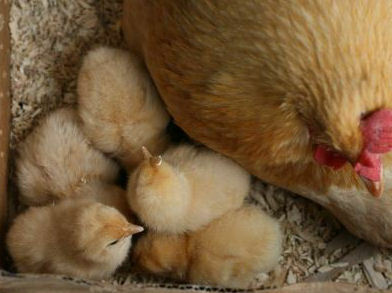 Nine buttery golden-yellow chicks were peeking out from Momma’s wings. Baby chicks are so darn cute. It’s so tempting to want to pick them up and play with them but Momma hen is very protective; so I resist temptation and watch from afar daring not to invade her space. The first few days they stay real close to Mama Buff Orpington as she provides warmth for the baby Orpington chicks. As the week progressed (and with the help of some very warm weather) the chicks began venturing out from under the hen to explore the “maternity ward” hen house we have for our hens with chicks. We keep them separate from the rest of the flock so that the roosters and other hens can’t peck at them or stress out our new mother. She shepherded them around the little hen house floor like a drill sergeant clucking orders to keep them in line, or at least trying to. Order is not a thing that a group of baby chicks take to easily. They like helter-skelter more! On the very warm days the chicks are everywhere, but on the cooler ones they huddle under that nice plump mother hen to keep warm. 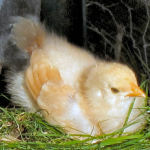 Tomorrow we are going to open the maternity ward door and let Mama Buff Orpington venture out into their private yard. 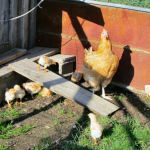 As the they get older they venture out from under Mama Buff Orpington more each day. Which Came first..The Chicken or the Fresh Eggs? These photos crtupae the absolute joy of having chickens. Chickens could teach humans a lot. Here is my top ten reasons to love a chicken:10. Chickens don’t drink and drive.9. Chickens don’t do drugs.8. 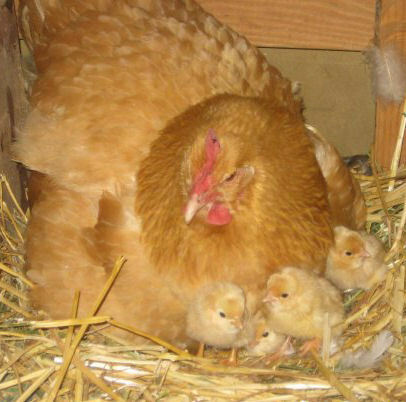 Mother chickens feed their babies first.7. Mother chickens teach all the basic skills a peep needs to survive and then allow them to find their own place in the pecking order in the coop.6. Chickens don’t cuss.5. Mother chickens know how to meditate especially when sitting on eggs.4. 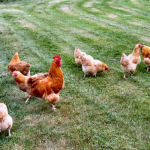 Chickens are the easiest pet to have and produce high protein food too.3. Mother hens will defend their young even at the cost of their own life.2. Chickens can survive days in the cold without a coat or boots.1. Chickens are just plain relaxing non-addicting fun to watch and be around.